The angle of the eyes is a barometer of attitude. When we’re positive, things are looking up. When we’re blue, we’re looking down. But looking down is a survival skill in Cairo. The sidewalks are not contiguous pathways, more like obstacle courses where a smooth section will have low hanging branches followed by a meter or more drop when the sidewalk makes way for a steep driveway to an underground garage. Nice people will put up plants in the way so you don’t tumble over the edge in the darkness on your walk home. The way around this is to walk in the street, which has even more hazards. So, much of the time as I walk here, I’m on the lookout for foot traps. Pot holes. Sudden dropoffs. Uneven stones. Foot-high curbs. Pointy barbs of metal poking up from the concrete. Charlie Brown had his kite-eating tree. I have my ankle trapping holes. 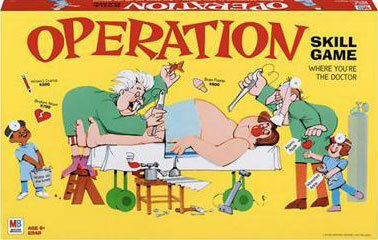 If they had a Cairo version of the “operation” game, I’m certain it would have mostly wrenched ankles (and I don’t even want to know what the lungs would look like). So I wear shoes with high tops – my Australian boots called Blundstones – even with a suit. And I keep my eyes on where I’m stepping. When I walk in New York, I’m always looking ahead, seeing who or what I need to get around in order to continue the brisk pace of a guy on the go. When walking here, I spend so much time watching my feet and scanning all directions for oncoming traffic that I rarely look up. Spending all that time looking down can’t help but affect your psyche. Like the gooky face mom always said was gonna stick if I didn’t stop, a downward cast can keep you down if you’re not careful. 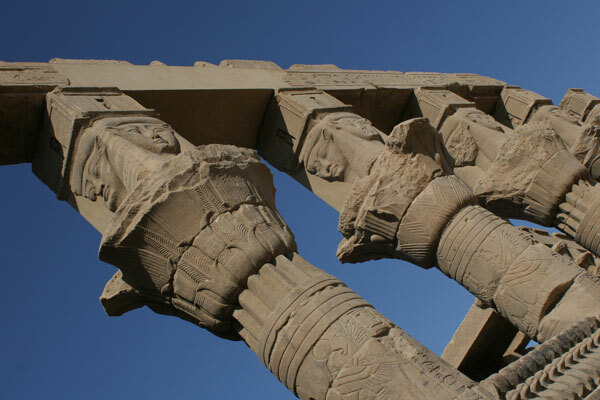 But in Upper Egypt, things were clearly looking up. 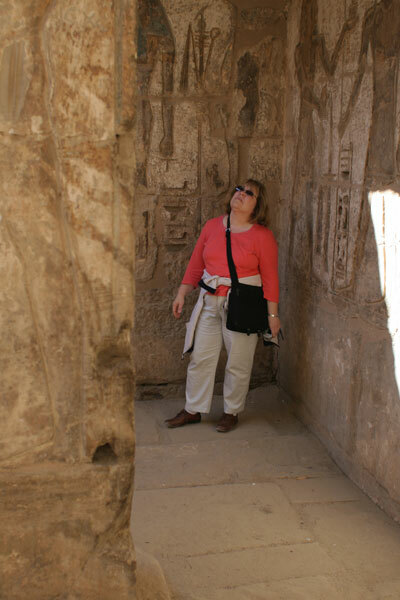 When you visit the great hypostyle hall in the temple of Karnak in Luxor, or gaze at the residual 3 thousand year-old paint on a ceiling of a place like Medinat Hebu, you’re forced to bend your neck back and gape. And the rewards are huge. 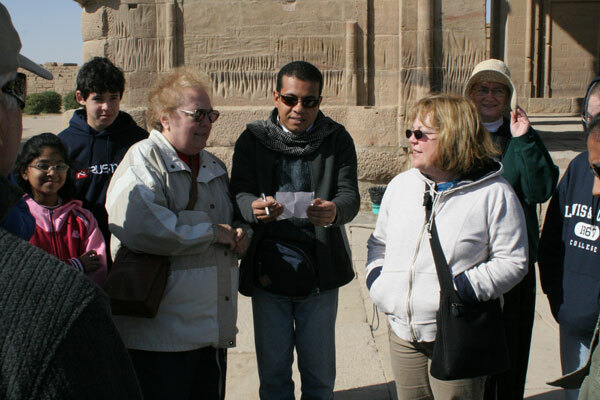 As my sister, mom and I floated down the Nile on the M/S Nile Symphony, making stops at the great Pharonic sites of ancient Egypt, our guide Rafik was often pointing above our heads. That’s where the gods are after all. 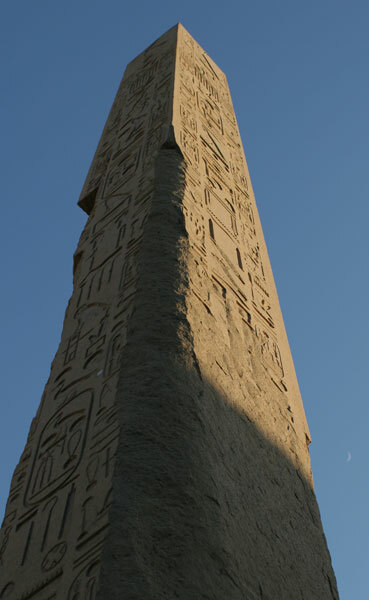 Obelisks jut upward. 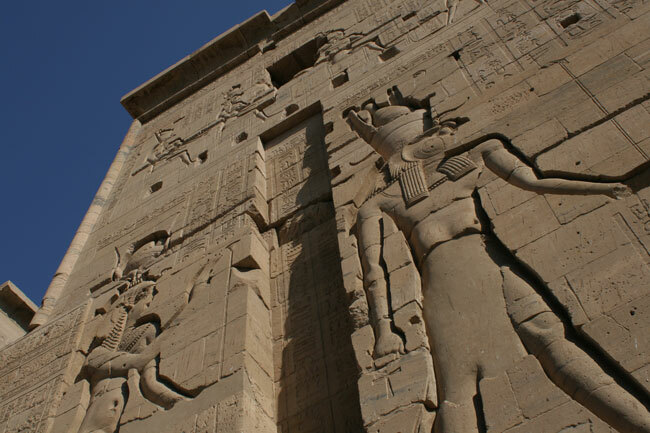 Massive walls loom with bas reliefs of long lost deities. Columns arch overhead, supporting beams where strategic gaps directed shafts of light to shine on artwork depicting a god’s journey on a barque surrounded by servants and conquered armies turned slaves. 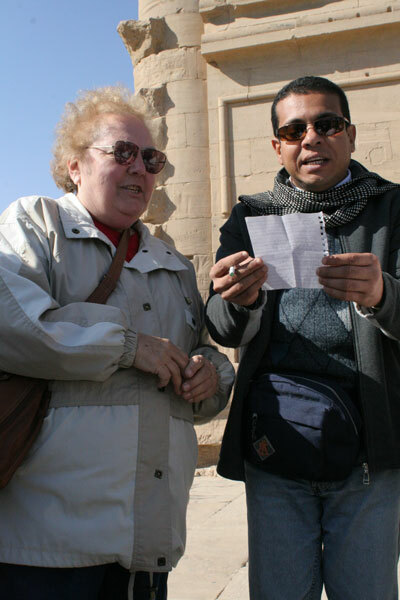 On bus trips, Rafik took a break from his talks on Egyptology to quiz us with riddles or read precious verses, downloaded from the Internet, of rhymed couplets extolling the virtues of angels. When he found out Mom sings alto in the church choir, he asked what her favorite Christmas carol is. 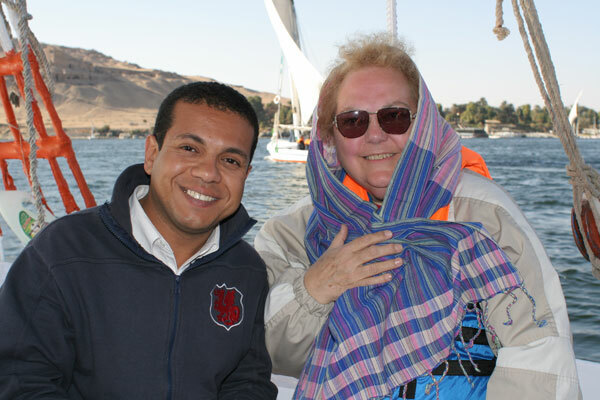 As we sat in the ship’s lounge, Mom and Laura sang “Away in a Manger,” and Rafik was overjoyed. He asked them to write out the lyrics for him. 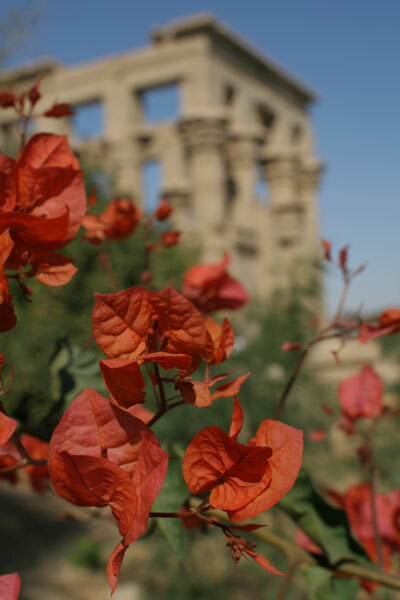 The next day at the temple of Philae – a striking island temple site that was dismantled and moved to save it from the flood waters from a dam built by the British in the early 1900’s – Rafik surprised mom and sis and insisted on a command performance of the carol for the whole group. He stood between them and sang, too. In front of the columned structure of an ancient mortuary, they sang in sweet voices – “I love the thee, Lord Jesus, look down from the sky and stay by my cradle till morning is nigh” – while the rest of us angels listened and a few joined in. It was awfully cute and just a little weird. 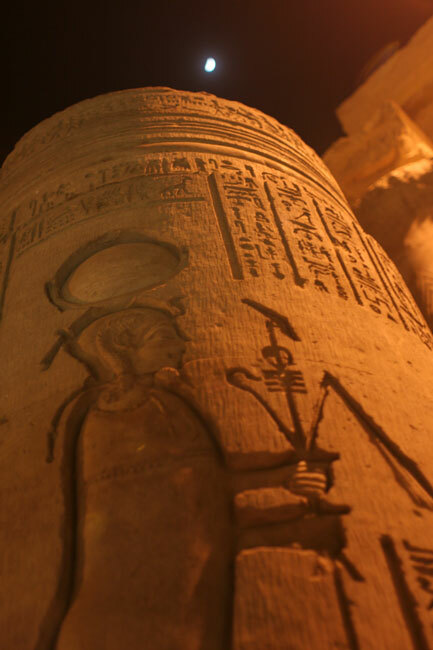 At the temples of Philae and Hatshepsut, I was struck by the images of the Egyptian goddess Hathor. 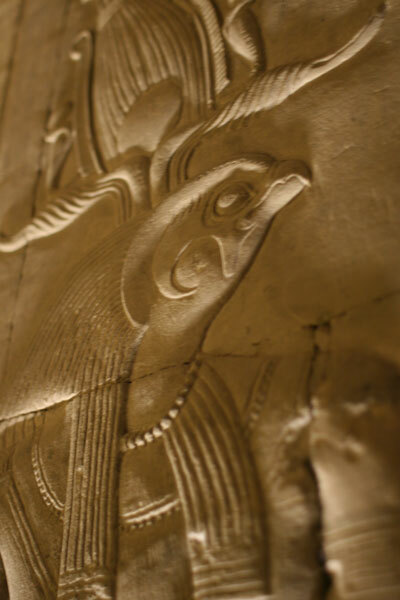 She’s the patron spirit of the arts and love – she was also both wet nurse and lover to Horus, the falcon-headed son of Osiris. (Wet nurse AND lover. That’s confusing enough to send even a powerful bird-headed god with a raptor’s beak into years of therapy.) In the depictions in stone carvings, she’s often seated sideways with a sun disk and cow horns on her head, or topping a pillar with an angelic face and elfin ears. 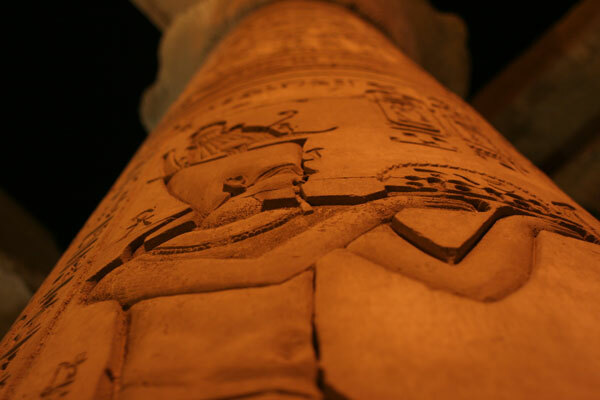 If one is permitted to have a favorite Egyptian goddess, then Hathor is mine (and not because of the wet nurse thing). Sometimes in order to get a picture, I find myself looking absolutely up, 90 degrees overhead. 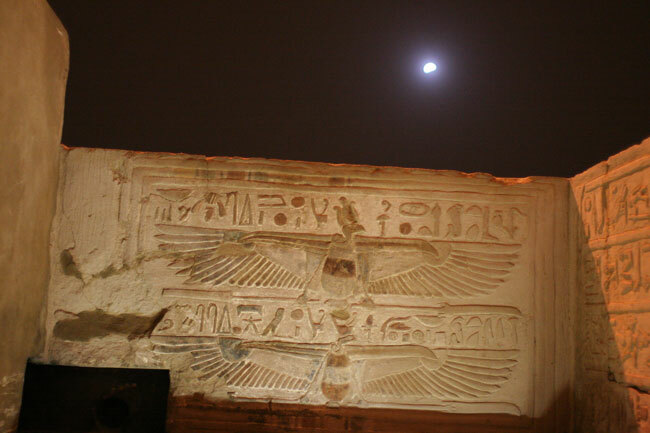 Arching backward or, in the case of this photo, lying on my back on the dusty temple floor to capture the lintel with the blue wings of the sun god Ra, and the real moon in the background. And we all know this notion of looking toward the heavens isn’t only for ancient polytheists. In my photos of Islamic Cairo, I’m also gazing upward: The lintel above a doorway; the artistic designs on the architectural structure that make an octagon on a square building, so a dome can be built above; the lamps hanging overhead; the archways and minarets. Up. Up. And up. 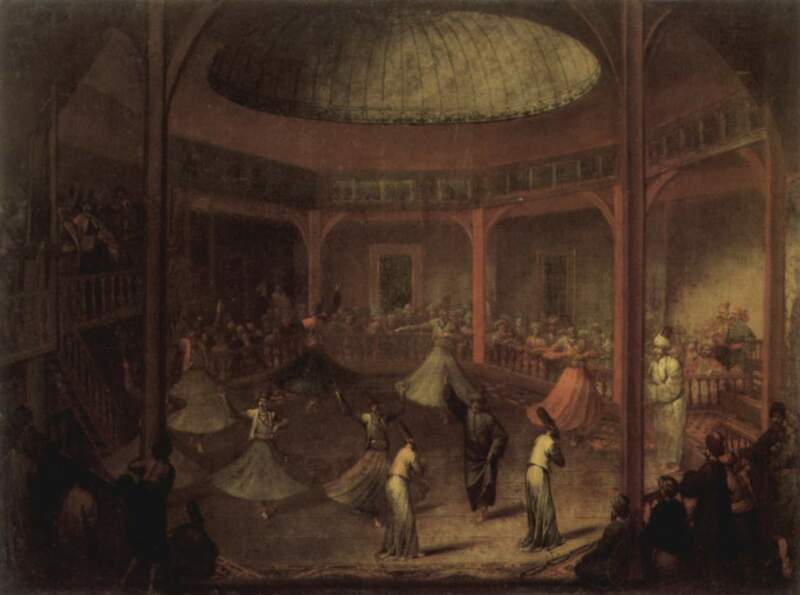 In the Mevlevi dervish theater, restored by a team led by an Italian archeologist/architect, there are photos (some by my AUC colleague Shems Friedlander) of the famous dervishes who spin on the floor. Their eyes are looking trance-like toward the sky as they pivot, one hand pointing down toward the ground, the other reaching up to the heavens, their spiraling bodies become intermediaries connecting the two in a whirling reverie. The metaphor of gazing at heaven and connecting it to a more grounded self, the idea of looking up, as opposed to looking down or looking ahead, is not lost on me. When I look up now in my neighborhood, I see things I didn’t notice before. I only just realized, for instance, that the building across from me with a rooftop billboard of a musical staff, is named for the classical Egyptian singer Om Kolthoum, Cairo’s answer to Ella Fitzgerald. There’s a statute of her in the square in front of the shop where I get my coffee every morning (I can see it as I type this right now, sipping coffee and sitting by the window with friends). It’s not really a new year’s resolution to look up more. But it’s happening naturally. After a few months of slogging through the challenges of living in a new place in a daunting culture and difficult city, my outlook is more consistently up than any other direction. Looking back on my four plus months here, I see that the seeds I planted are bearing fruit. And, as if guided by a dervish’s arms, things that take root tend to aim for the sky. How facinating . I feel very honored to be able to read about your travels.Your father and I recently met, and hopefully will become long term friends. I too was born and raised in Ohio, and so much of our growing up years are alike. I am so glad he sent me your blog. I have traveled a little, but never enough. I have not been to Egypt. I have been to Europe twice, also been to Mexico several times, South america, and the carribbean, and several cruises, and lived and traveled all over the US. I shall look forward to hearing of your next travels. Thank you so much. Your father is very proud of you.